* To us, you come first...always! We own and run the company ourselves. You deal directly with us - no intermediaries. We firmly believe that we can only be successful if our customers are completely satisfied. * Everything you buy from us is fully protected by our money back guarantee. All we would ask is that if you are not sure of a pattern or color then order a small amount (5 piece setting) rather than a full service. * We firmly believe that the products we sell are of the highest quality from small manufacturers made in the country of origin using traditional skills. We support this with our money back guarantee. * Very early on we decided that credit card information processing must be an absolute priority and we use a specialist third party company Sagepay to manage securely the whole process. Giverny Range, Monet - For more than 25 years Robert Haviland & C. Parlon, have been working closely with the Museum Claude Monet in Giverny and have recreated the original table settings designed by Monet for his own use. 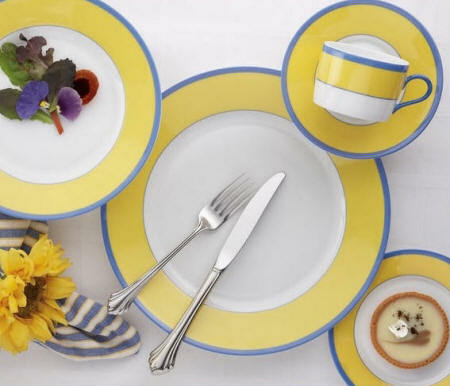 The Monet porcelain dinnerware collection has been both successful artistically and commercially throughout the world. porcelain is still decorated by hand. craftsmen with two layers of gold or platinum. When the pieces have been fired, they are hand polished with an agate stone which give depth and richness. design studio, old copies or drawings discovered in prestigious museums, and the portfolios of antique dealers and collectors.